When it comes to going on safari, not too many people think of Uganda. There’s good enough reason for that; Uganda is no Kenya or Tanzania, no South Africa or Namibia. It’s highlight is its gorillas, not the typical safari animals. If you’re planning a once-in-a-lifetime safari adventure, I wouldn’t advise making Uganda your destination. But if you’re in Uganda for some other reason–to see the gorillas, raft the White Nile, enjoy the lush green landscape, or spend time with the friendly people–then you ought to take a few days to enjoy a Ugandan safari in their prime reserve, Queen Elizabeth National Park. You’ll miss some of the typical animals. Due to a case of rinderpest that struck in the early 1900s, there are no zebras, giraffes, and wildebeests. 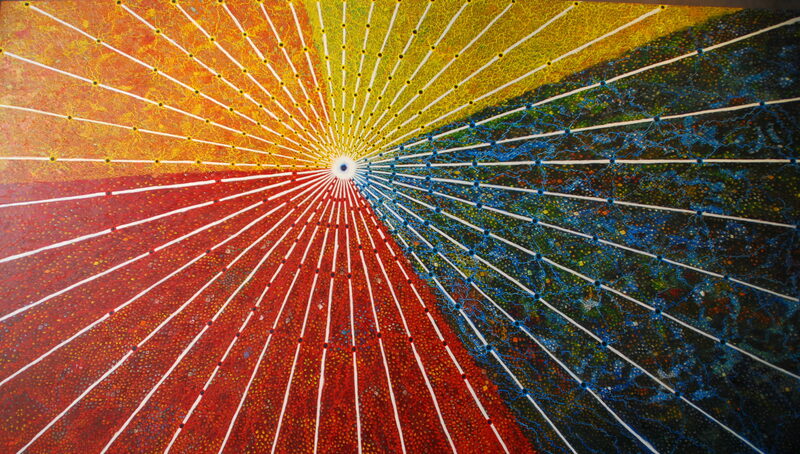 As you usually see these in great abundance, their abscence was, at least for us, quite striking. You also won’t find rhinos, which I believe were pretty much poached out of existence. And you won’t find cheetahs stalking across the plains, though I’m not sure whether their absence is due to disease, poaching, or simple geographic issues. You will, however, find heaps and heaps of antelope, most notably waterbuck, Uganda kob (their national animal), and tobi. You’ll also find elephants, large herds of Cape buffalo, and leopards (but only if you are much luckier than we are). All cool for sure but not really worth going out of your way for. 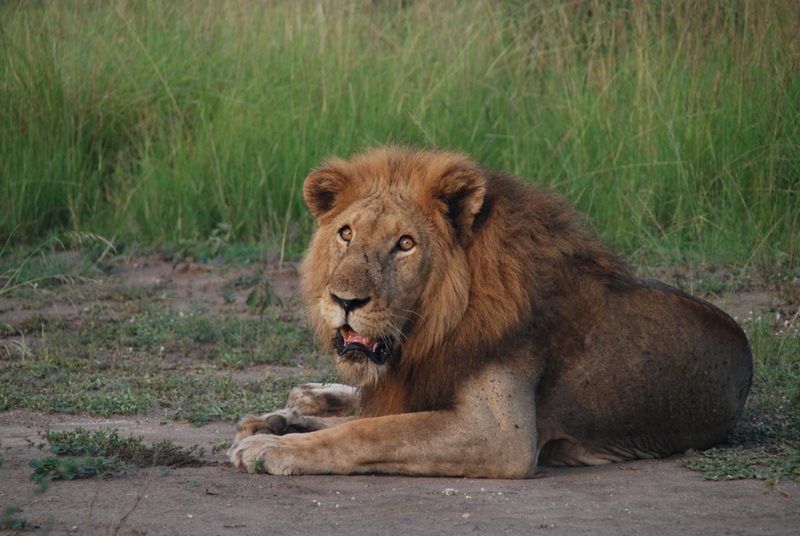 But if you like lions, then Queen Elizabeth National Park should be on your list, as we saw many. One morning we observed a group of female lions with their cubs, while the next morning we were treated to a large male lion lying right next to the road. 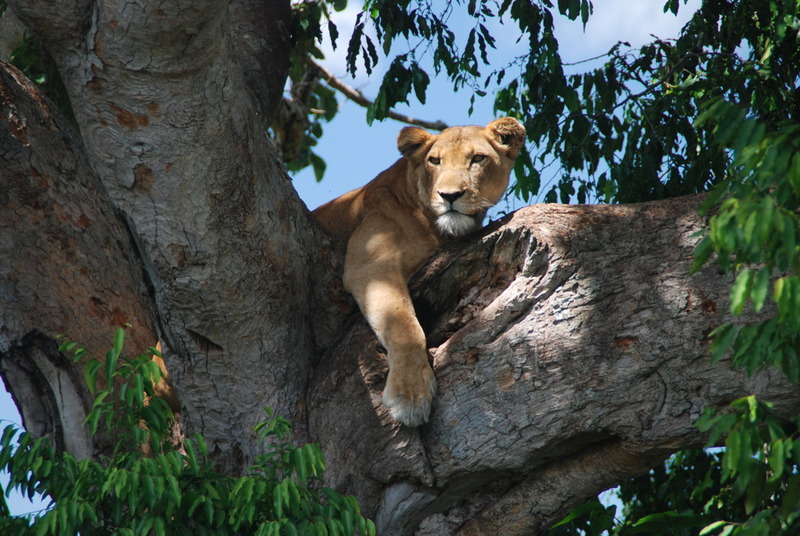 Best of all, however, are the park’s famed tree-climbing lions. Though no different genetically from any other lions in Africa, these lions, which live in an area populated with easy-to-climb fig trees, have developed the behavior of resting in trees during the day. (Or at least the females have; the males are too heavy and remain in the thickets at the base of the trees.) Located exclusively in the Ishasha section of the park, an area a bit off the beaten track, the lions are an unusual treat, and we were lucky enough to spot two lazing in a tree, seemingly without a care in the world and without even the slightest bit of interest in us. If primates are more your thing, the park is also a prime destination. 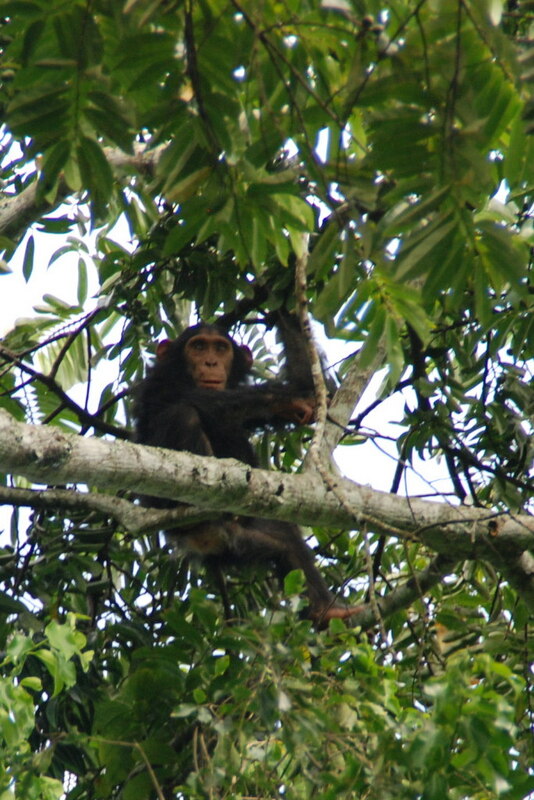 On guided chimpanzee walks, you can descend into a lush gorge and track down our closest ancestor. You’ll probably find them high above you in the trees, but sometimes they scamper down and share the path with you. 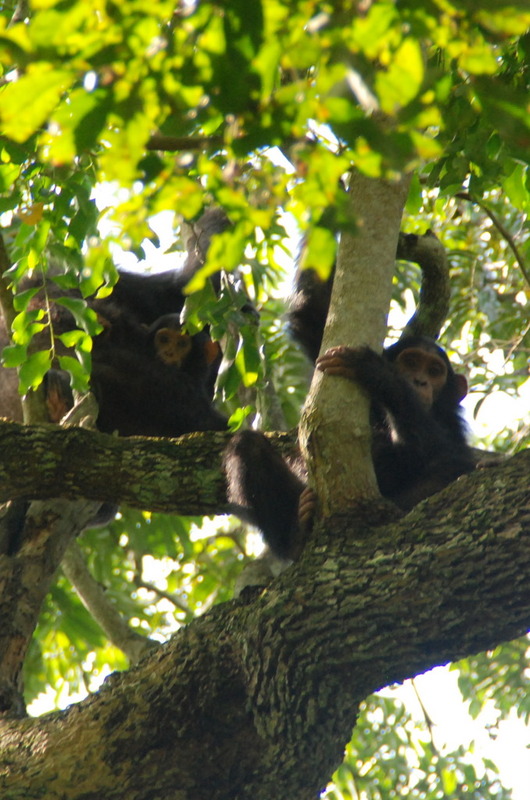 You may also spot baboons, colobus monkeys, and a variety of other species. And since the paths you are walking are actually animal tracks, you could come across pretty much any other animal that lives in the park. Though we saw hyena and lion dung, we only actually spotted a few elephants making their way down to the water as well as a school of hippos. Speaking of hippos, they gather in great abundance in the channel that runs through the park, connecting Lake Edward and Lake George. On a boat ride down the water, you’ll catch hippos barking, hippos yawning, hippos exhaling, hippos lumbering, and hippos doing pretty much anything else that hippos do. You’ll also spot zillions of birds as well as a few small crocs and some buffalo. 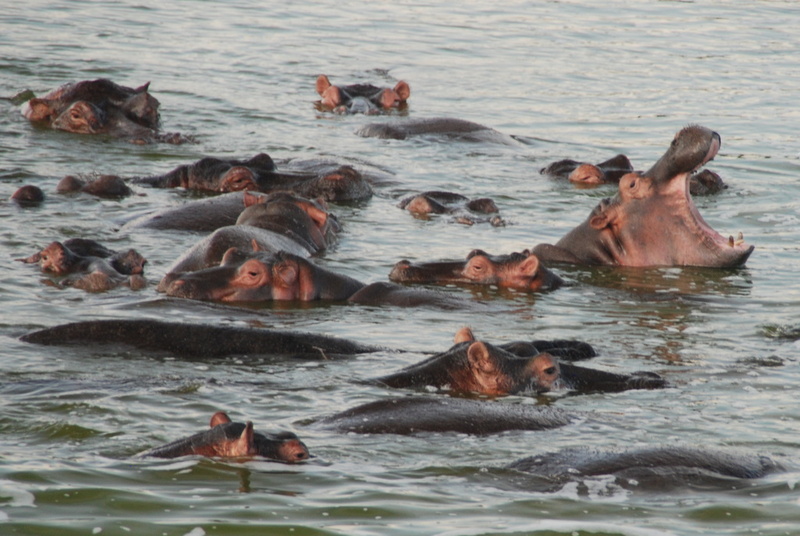 And if you’re lucky, perhaps the bare bum of a local bathing just a few meters away from a hippo! If you don’t want to take a boat ride but want to get up close and personal with a hippo, then just plan to have dinner at the lodge. As the sunsets the hippos waddle out of the water and plant their enormous selves on the lawn, which they very kindly mow each evening. It’s a charming way to end the day at a park that isn’t quite top-of-the-list but is quirky and fun and boasts a few features that you’ll be hardpressed to find elsewhere.